For your ultimate pleasure the most important consideration is aesthetics. Before you consider that, how are you going to use the spa? What mood do you want to create around your spa? Do you want it to be “Grand Central Spa”, the center of family activity and entertaining in the garden, or a place of solitude and quiet reflection hidden from view? Will it be an adults-only relaxation environment or will you use it for family gatherings and social entertainment? The size of your yard will make a big difference. Even if you have a large suburban plot, place the spa as close to your home as possible. You want the focal point of your yard to be the view from the spa. In a small urban plot, a centrally located spa could hamper traffic flow, use up too much available space, and be out of proportion and overwhelm a small yard. In this case, it would be better to put the spa off by itself, close to the door you’ll be using to reach it. 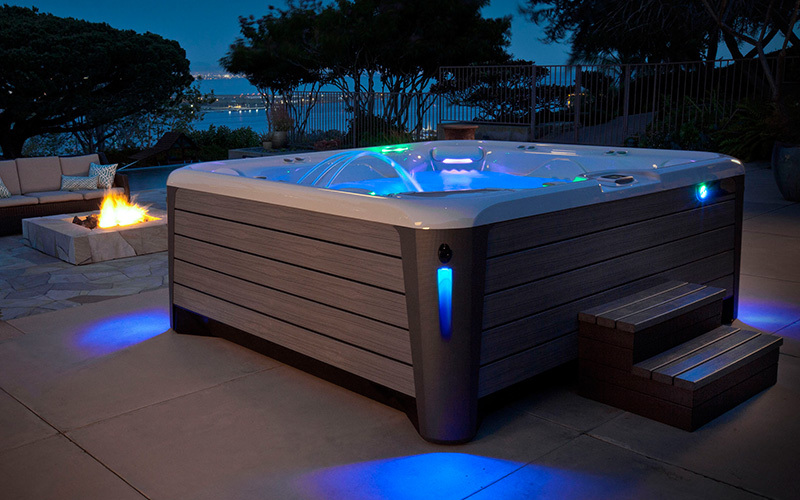 Since most spa use is at night, consider mood lighting to help create a special atmosphere, and don’t forget the magical effects of starry nights, sunsets, and moonbeams when placing your spa. Whatever you decide, you’ll enjoy your spa more if it’s in harmony with its surroundings. The beauty of a spa is that you can enjoy it 365 days a year, make that night and day. So, consider the sun, shade and wind patterns in each of the different seasons. Do you want a roof to shed rain or provide shade in summer? A windy area is not fun when you’re tubbing. Consider glass windbreaks. Are you a stargazer? You’ll want to experience the stars without a roof. If privacy from too close neighbors or shelter from the elements is a concern, Olympic offers enclosures specifically designed to complement any spa environment such as gazebos, teahouses and redwood-look mounts that actually attach to the spa. Be sure to match your structure to your site. You’ll want the structure to be in proportion to your yard. Screening may be necessary for several reasons. It can act as a barrier between you and something unsightly, provide privacy from your neighbors, and even create an interesting backdrop to your spa. Lattice or tall plants in pots are frequently used for spa screening. Bathers can get quite warm while soaking, so choose a screen that provides good air circulation while cutting the strong wind. Patio coverings range from simple to complex. You can create different environments by selecting particular types of wood, posts and lattice design, sealant, satin or paint. The amount of sunlight and privacy can be controlled by how close the spacing of the lattice is. Growing flowering and fragrant vines on the covering produces a very cozy atmosphere.